WHEN Dr. Netha Dyck [BN/88] graduated from the U of M with a bachelor of nursing in 1988, she never imagined she’d be back on campus three decades later as dean of the College of Nursing. She’s not only grateful for her appointment, she’s happy to be home. “I’m delighted to be back,” Dyck says. “I’ve been in leadership roles for most of my career, spanning clinical practice, education and professional associations. Dyck grew up in Winkler, Man. After completing her diploma and bachelor’s degree in nursing in Winnipeg, she moved on to obtain her master’s in administration (with a concentration in health services) from Central Michigan University and her doctorate in higher education leadership from the University of Calgary. From 1998 to 2005, she was director of the Winnipeg Regional Health Authority’s personal care home program, overseeing the delivery of quality care at 39 facilities. 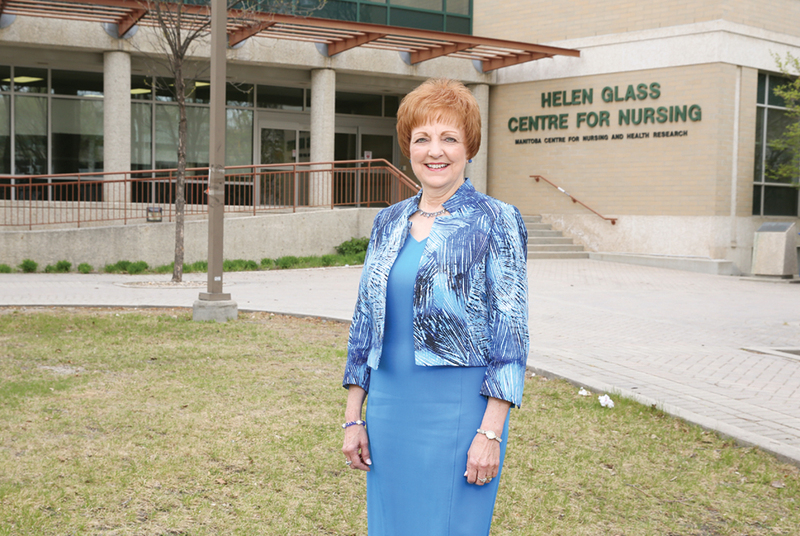 Prior to returning to the U of M, Dyck spent almost 13 years as dean of the School of Nursing and School of Health Sciences at Saskatchewan Polytechnic in Saskatoon, overseeing 34 programs, 385 faculty and staff, more than 4,000 students and a $30-million budget. That experience, she says, fully prepared her to take on her current role, which began in February. Dyck says she is engaging her entire team of faculty and staff, along with students and community partners, in the development of a strong vision for the college. It will include incorporating best practices and leading-edge technologies in the delivery of student-centred education. Her priorities also include enhancing simulation learning, advancing inter-professional education and collaborative practice, Indigenizing the curriculum, and offering international student and faculty exchanges. “We will also support faculty and student engagement in research, and continue to build on the exceptional work done by our Manitoba Centre for Nursing and Health Research,” says Dyck. “We want to expand our interdisciplinary and international collaborative research. During Dyck’s deanship at the Saskatchewan Polytechnic School of Nursing, the school celebrated its 50th anniversary. It just so happens that the U of M’s College of Nursing will mark its 75th anniversary this fall, and Dyck is helping to guide the celebrations. “At Saskatchewan Polytechnic we had 10 grads from the original class there to celebrate with us from across Canada and the U.S.,” she says. “It was so special to meet with those grads and hear about the invaluable contributions they made to the profession. After just a few months back in Winnipeg, Dyck says she is well settled in at home and work. Of course, having spent more than a decade in the rival province to the west means Dyck and her husband have endured their fair share of goodnatured ribbing since returning.